Members and friends of the Diocese of Juneau gathered January 19 at St. Paul the Apostle Church to say goodbye and offer thanks to their Bishop, Edward J. Burns, following his recent appointment by Pope Francis as the new Bishop of Dallas, Texas. But Bishop Burns, shepherd of the Diocese of Juneau since April of 2009, shared during his homily at the Farewell Mass that he had much in the way of gratitude and thanks of his own to offer Southeast Alaska Catholics — for their warm welcome, for their faithfulness, and for their support as he himself grew in his role as bishop. Arriving in Juneau as a newly ordained bishop nearly 8 years ago, Bishop Burns recalls with fondness the events surrounding his installation as bishop and has never forgotten the excitement of that weekend and the gracious and warm welcome he was given. Prior to his assignment as Bishop of Juneau, Bishop Burns had read about the explorers and missionary adventurers who first brought the Catholic faith to Alaska, commenting at his installation Mass, “I stand before you wanting to continue the exploration, an exploration of my own soul and my relationship with Jesus Christ.” He followed by saying that he was looking forward to the “time of formation” to learn the new responsibilities and duties involved with being a bishop. At one point during that 2009 Installation Mass, Burns mistakenly said Pittsburgh (his hometown) instead of Juneau and caused a mild stir in the congregation. “You are looking at a rookie bishop!” he quipped as the assembly applauded and laughed. Over the past 8 years, Bishop Burns has certainly left his ‘Rookie Bishop’ status behind and has continued his journey as a frequent homilist, catechist and retreat leader at state, national and international events, as well as holding key positions on USCCB committees and boards such as the Committee on the Protection of Children and Young People. As just one example of that in recent years, and as one highpoint of his time in Southeast Alaska, Bishop Burns reflected on the 2013 Diocese of Juneau Synod, and the opportunity he was given to visit each of the parishes in Southeast Alaska as preparation. The byproducts of the 2013 Diocesan Synod were his Pastoral Letter, “To Know, Love and Serve Jesus Christ through His Body – the Church,” (June 2014) as well as a 2015 – 2020 Pastoral Plan for the Diocese. 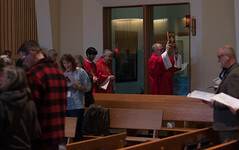 In addition, Bishop Burns added, the Synod process helped him understand why people of the Diocese enjoyed and spoke of the ‘Institute’ so frequently – the Institute was a regular diocesan gathering that had been held in years past– and he was very pleased that the new Southeast Alaska Catholic Conference was successfully organized and held in Juneau last October. “It was truly phenomenal,” he remembers. One unfulfilled opportunity he regrets having to leave as he departs the Diocese of Juneau is the cause for canonization of Father Pasquale Tosi, an early Italian Catholic missionary to Alaska who is buried at Evergreen Cemetery in Juneau. “We have every opportunity to do that,” he emphasized, on initiating the canonization process. Bishop Burns recalled the 2014 Diocese of Juneau Pilgrimage to Fr. Tosi’s birthplace in Italy. “To see how he is so revered there (Rimini, Italy), and to remember how he had been given the opportunity to become a bishop in Alaska by Pope Leo, but he humbly declined, saying, ‘In Alaska when we travel, we travel with dogs. If the weather is bad, we get into a hole with the dogs, and that hole is no place for the purple of the bishop…’” Bishop Burns said he would encourage the next bishop to look into the cause for canonization of Fr. Tosi. One of the unique and learning aspects of his ministry as Bishop of Juneau that Bishop Burns has appreciated was the interaction with the Alaska State Legislature in the State Capitol through his work with the Alaska Catholic Conference of Bishops. Burns shared that this was his first experience in engaging with State legislators to build up the common good of society, and he sees this as something he hopes to bring forward to his ministry as Bishop of Dallas. Also, Bishop Burns pointed to the aspect of learning about the governance of a Diocese as something he has gained during his time in Southeast Alaska. 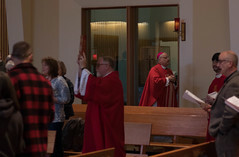 When he came to Juneau, he came as an Ordinary, not an Auxiliary Bishop, so it was an opportunity for him to learn how best to govern a diocese. “Learning how to utilize the host of faithful and dedicated people on various boards, committees and councils to gain their wisdom so as to make prudent judgments on governing the diocese was a great learning opportunity,” he related. Bishop Burns departs feeling hopeful about the future of our diocese, and sees one of the strengths of the Diocese of Juneau as its potential for growth. “This diocese is poised for growth,” he affirmed. “With the desire stated in the Pastoral Plan that we are going to grow our numbers by 50% — I truly believe it’s doable, especially because of the number of inactive Catholics that we have in the area. If we could reawaken in them a relationship with Jesus Christ, and invite them back to the celebration of God’s word and his sacraments, I think we can surely increase the numbers in our pews. I think we just need to be intentional about doing it.” Burns continued by pointing out that the Pastoral Plan has identified catechesis and evangelization as priorities. With those in place, and effectively executing and carrying these out, the diocese can surely achieve the goal of increasing its numbers, he emphasized. In addition, with the recent growth at the Shrine of St. Therese – now a National Shrine – and with the possibility for the renovation of the Cathedral of the Nativity of the Blessed Virgin Mary, with St. Paul the Apostle Church being identified as a Co-Cathedral, and coupled with the hope that the Diocese will have two seminarians next year, Burns sees a great deal of potential for our diocese. “The staff of the Chancery is like family, and I have become endeared to the parish communities. It’s also going to be difficult leaving the beauty of this area … I’m already going through withdrawal.” In Dallas he will not have the opportunity to put on his rain gear and backpack and walk to the office as he was accustomed to doing in Juneau. While looking forward to learning about the people of Dallas, and embracing the Hispanic culture and language, Bishop Burns will remember fondly the people of Southeast Alaska, the casual comfort level and close-knit aspect of life here. Burns recalled that in walking to work in Juneau on various occasions, he could truly be a ‘Shepherd of the streets’ and engage with the homeless and others in the community he met along his way. – Thank you, Bishop Burns, for your ministry here with the people of Southeast Alaska. May God continue to bless you and the good people of Dallas, Texas!